I am moving back to Columbia in wake of my senior year at good old USC, and it is possibly the worst weekend ever to leave Charleston. That’s because the potentially two best album releases of the summer are this Friday and Saturday night at The Charleston Music Hall as part of the Summer Harvest celebration of local art and music. There’s also a local poetry night tonight to kick things off featuring 15 local breathers of the word and a poetry/jazz disc release. This is the perfect weekend, and I’m missing it…like I’m crying on the inside. Since I can’t make it, then you people reading this better go! Michael Flynn will be releasing his solo debut album Face in the Cloud. This guy knows how to mix heavy emotions and electronic music into the best possible coalescence. Flynn was my favorite performance of the night at the earlier Hearts and Plugs showcase this summer at King Dusko, and I can only imagine what it will be like when he gets to play a full set of transcendental tracks in the spotlight. Mind-blowing, soul-searching, earth-shattering – one of these for sure if not all the above. 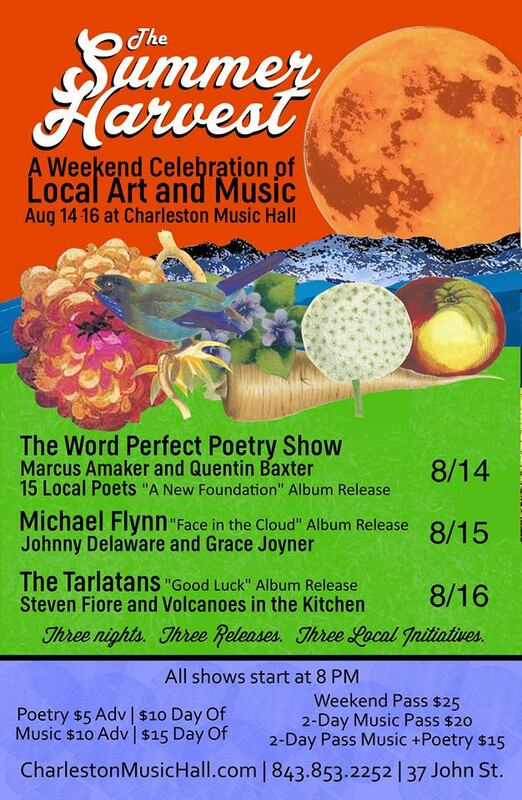 The next show makes me giddy with joy, because folksy family band Volcanoes in the Kitchen that I featured on Soundwaves near the beginning of the summer will be opening for The Tarlatans’ Good Luck release show. It makes me a happy parent to know that the beforehand low-key family bunch are now thriving in the Chucktown music scene. They are stars. P.S. The poster says all shows start at 8 p.m., but the Facebook page for the Sat. event says it kicks off at 7 p.m., so I’d get there at the earliest time slot so as not to miss Volcanoes in the Kitchen!